Apparently Mirka is still hanging around at Federer's box. So, no special announcement from Federer yet as Mirka was seen at her husband's match against Philipp Kohlschreiber yesterday. Federer dropped the third set but went on to win 6-3, 6-2, 6-7, 6-1. 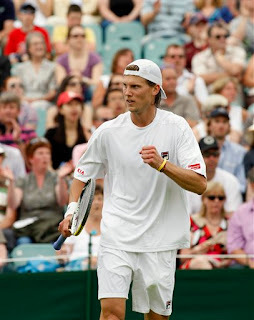 Tommy Haas' actress girlfriend Sara Foster was also spotted at the Wimbledon. The 90210 star showing off her Blackberry and pouty lips. 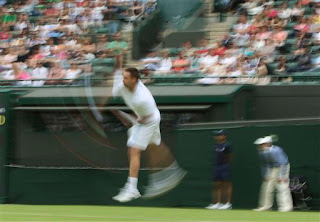 The match against Marin Cilic continued on the 6th day and Haas eventually won 7-5, 7-5, 1-6, 6-7, 10-8. I think we'll be seeing a lot more of Foster. It's almost 3 a.m. but I think I need to post this up before I go to bed. It was heartbreaking to learn that Michael Jackson has passed on. May he rest in peace. A few tennis stars joined the world in paying tribute to the King of Pop. 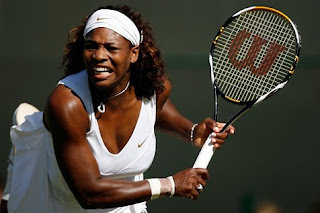 Serena Williams who has met the King of Pop a couple of times said, "Words can't express my shock and horror." "He was just a complete icon." Although Serena wasn't able to name her favorite Jackson song she praised him, calling him "the greatest entertainer for me of all time". "He did things that no one else did," she said. "Like 'Thriller' is the best video ever made still to this day. The videos that he did for his songs, no one had ever even went that far." "And he started a whole new trend with that. Dances, singing, beats, you know, everything." "I think Michael Jackson, everyone listens to his music," she said. "It's like you think of the Beatles, you think of Elvis Presley, you think of Michael Jackson. Those are just lifetime icons that I've never forgotten. The things that he did was beyond iconic." Serena took time to post a personal condolence message to the bereaved family on her twitter page. “My heart goes out to the entire Jackson Family,” she wrote. Other players who also expressed regret at the loss of Michael were Roger Federer and Andy Roddick. "It was 1988 or 1989, he came to Basel and I went down to the stadium with my sister. We were still very young and we listened to the music while we stood outside," Federer said. "I love his music. He touched many people and I will listen to his music for many years to come." 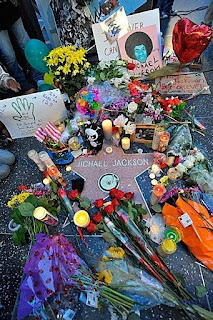 Andy Roddick wrote on Twitter, "oh my lord..... michael jackson died........ RIP sad and surreal." And in a later post he added: "regardless of what u think of him he was completely revolutionary and will be missed." 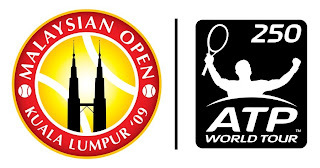 After months of speculation, Kuala Lumpur, Malaysia is confirmed the latest stop on the ATP World Tour! 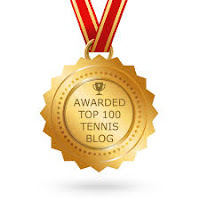 At HCFoo's Tennis Blog, we promise to bring you both on-court and off-court coverage of the ATP 250 Malaysian Open between September 26 to October 4, 2009! Before I share with you my experience at the press conference today, let me share with you the messages from the players - David Ferrer, Nikolay Davydenko, Fernando Verdasco, Gael Monfils and Kei Nishikori are some of the big names who will be playing in Kuala Lumpur! 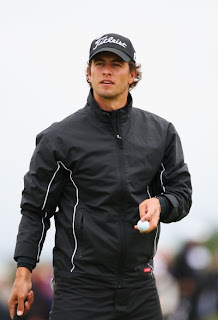 The other players who have confirmed their participations are Robin Soderling and Fernando Gonzalez. 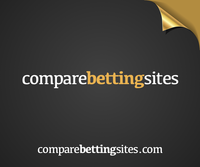 For more info regarding about the tournament, visit the Malaysian Open official website. We have seen them here before, now let's go behind the scene of the photoshoot. Victoria Azarenka (in the B&W picture), Alona Bondarenko, Anna Chakvetadze and Dominika Cibulkova will all feature in the August issue of FHM – on shelves July 2, 2009. So don't miss it! Wimbledon Day Three: You've gotta love post-match interviews! To tell you the truth, I don't feel the excitement of Wimbledon already after Roger Federer vs Rendy Lu Yen-hsun match. But life goes on and I still have to do my 'job'. There are a few things that keep me entertained though - reading post-match interviews. Check out some of these Q&A... the media can be very annoying... and at times funny too. Fernando Verdasco survived four gruelling sets to beat Kristof Vliegen 7-6(7-3), 6-7(3-7), 7-6(7-4), 6-4 to make the third round. Q. Is the rumor true that after Laura Robson's loss in the first round that you telephoned her to console her about this loss? 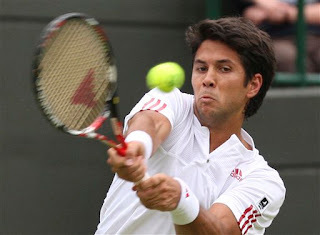 VERDASCO: No. Who said that? Q. Rumor. (Changing topic) Which part do you admire the most about Federer? Roger Federer has a comfortable 6-2, 6-2, 6-4 victory over Guillermo Garcia-Lopez. FEDERER: No, no, not really. She's just not feeling, you know, a hundred percent. She only felt 95%, so we decided it's better if she takes it easy instead of sitting in the sun maybe, feeling worse the next day. FEDERER: I never said it. I don't know who told you, but... you can speculate as much as you want. 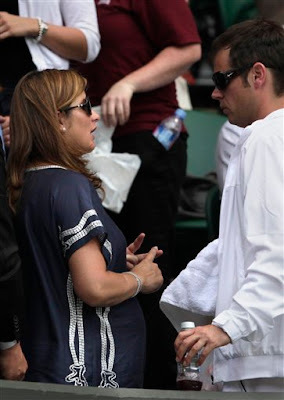 FEDERER: Mirka told you? I'm sure she did (smiling). FEDERER: She invited you, too, didn't she? Gisela Dulko defeated Maria Sharapova 6-2, 3-6, 6-4. Q. 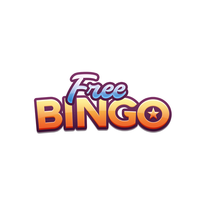 What is your football team in Argentina? 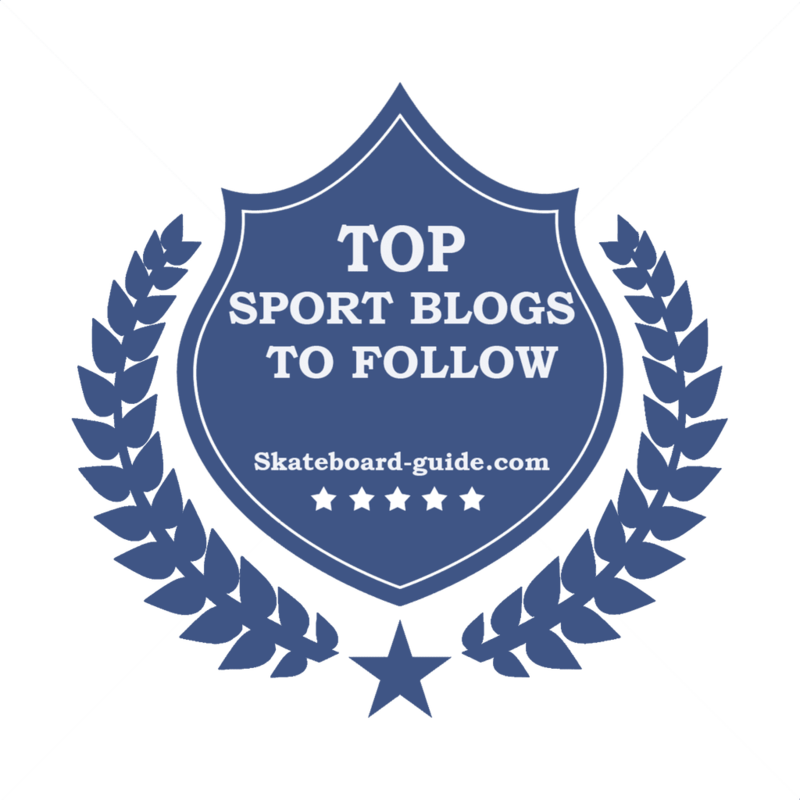 DULKO: Football? Boca and Tigre. DULKO: We talking about tennis here. Not personal, no. I'm not gonna talk about that. Note: Obviously the person who asked this question didn't know that Dulko is dating Fernando Gonzalez. Serena Williams spentless than an hour to get past Jarmila Groth to win 6-2, 6-1. Q. Can you comment on Larry Scott. He's leaving at the end of the week. His tenure. WILLIAMS: Ten years. Was it ten years already? Sania Mirza’s singles campaign at Wimbledon ended with a 6-4, 6-4 to Sorana Cirstea. MIRZA: No, he's not here. Q. Do you call him before the match? Does he call you? MIRZA: That's a bit personal. Novak Djokovic moved into round three with a 7-5, 6-1, 6-4 victory over Simon Greul. Q. Let me ask you about last year's Olympic Games. You were playing there, but there had been discussions about air quality before the games. Were you actually worried going there playing? How did you feel when you were actually playing there? 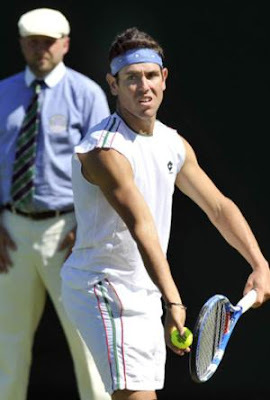 Michael Llodra crashed out of Wimbledon when a collision with the umpire's chair and a ball girl brought an abrupt end to his second round match against Tommy Haas during the seventh game yesterday. He was sprinting towards Haas dropshot in the fifth game when he couldn't apply the breaks. 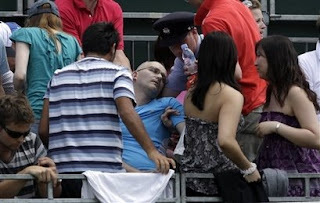 Llodra slammed into the umpire's chair before collapsing on top of the ball girl. A player's chair was knocked over and a bin went flying due to the impact. Llodra asked the ball girl whether she was okay and gave her a hug before resuming the match. He tried to get back into the game but it was over by the 20th minute of the match. Much to the crowd’s delight, after Llodra left the court Haas played several rallies with a ballboy and then a ballgirl. Elena Baltacha, the last British woman in Wimbledon yesterday found herself having to apologise for uttering an expletive that she did not remember. She said, "Someone told me I said the F-word out loud, but I do not remember that. I shouted a few things, but they were in Russian." "If I have offended anyone, then I am sorry." Baltacha will take on Belgium's Kirsten Flipkens with the hope of reaching the third round of Wimbledon and climbing into the world's top 100 for the first time. 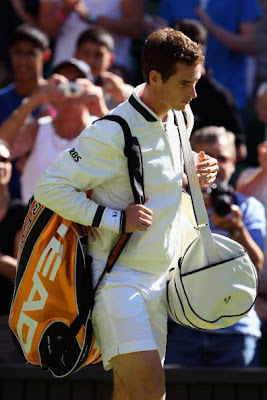 Looks like nobody's interested to talk about Andy Murray's new Fred Perry kit when he made his debut at the Centre Court yesterday. 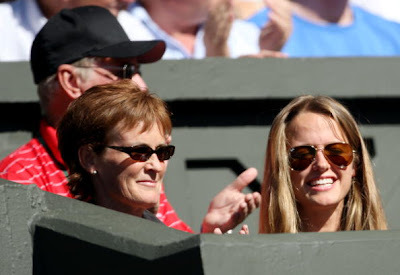 Judy and girlfriend Kim Sears happy and proud with their favourite guy. Perhaps the only person worth talking about was Robert Kendrick. At one point during the ninth game, a diving volley from Kendrick was said to be a reminiscent of Boris Becker in his prime. 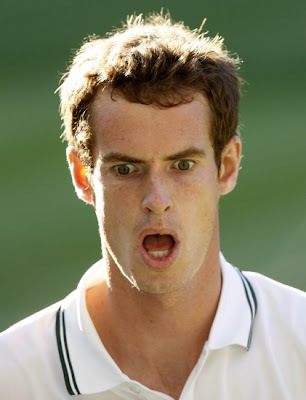 .... and nobody else was more shocked than Murray himself. I bet Kendrick hate losing to Murray already! 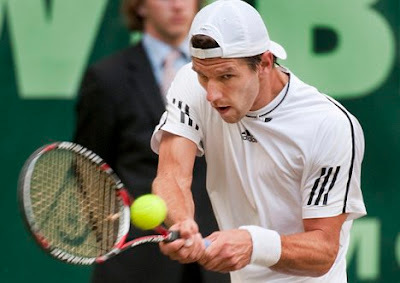 A number of betting companies contacted the Tennis Integrity Unit after thousands of pounds were staked at several betting shops on a straight-sets victory for Jurgen Melzer. Paddy Power and Ladbrokes stopped taking bets more than hour before the match, while the online betting company, Betfair, became suspicious when more than £350,000 went on Melzer two hours before the start of play. The Tennis Integrity Unit is expected to look into the game to determine whether the patterns were sinister or simply reflected fans' judgment that the little-fancied Odesnik, who was carrying an injury, was likely to lose heavily. VIDEO: Caroline Wozniacki two-timing two players on court? Don't worry... this is not another gossip about Caroline Wozniacki. It was just part of the Sony Ericsson WTA Tour Hero Challenges, where the Danish rising star shows her incredible speed and anticipation in a rather unique match-up! Also check out Venus Williams serves up some pain on a professional American Football defensive line. And lastly Elena Dementieva, who was once regarded as having a weak serve, proves those days are so over. 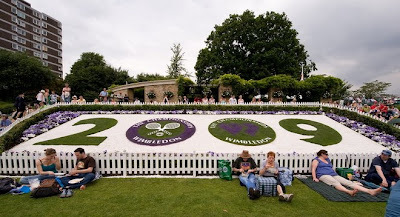 The 2009 Wimbledon Grand Slam Tennis doesn't belong to Roger Federer alone. There are many other players in the tournament too. So, let's take a look at some of the happenings on Day 1 yesterday. First of all, I was really, really upset with ESPN Star Sports yesterday because they failed to show Federer making his Centre Court appearance. Don't they already know all the hype about Federer's Wimbledon jacket? Instead they showed Sania Mirza's match! Besides, as an Asian-based sports broadcaster, how can Star Sports not show Asia's no.1 men's player, Rendy Lu Yen-hsun against the unofficial-GOAT from the beginning? 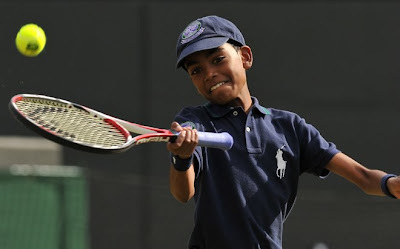 I supposed Star Sports worried that Rendy may be bageled thrice by Federer? You know what, they only start to show the match after convinced that Rendy can actually play! And by the way I have nothing against Sania. Just like Vijay Amritraj, I admire Sania too. I'm just as happy when I saw Sania beat Anna-Lena Groenefeld 6-2, 2-6, 6-2. No.4 seed Novak Djokovic came from a set down to defeat Julien Benneteau 6-7(8-10), 7-6(7-1), 6-2, 6-4. 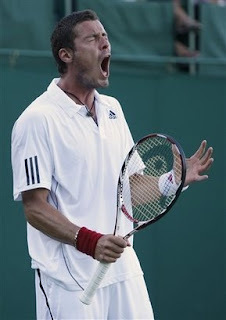 During the match, Benneteau had a couple of painful moments. First, he slipped and hurt his knee earlier in the match before inflicting further damage to himself when he crashed into the screen at the back of the court trying to reach a Djokovic lob! Ouchh! Robin Soderling continues his Grand Slam run to the second round after rallying to beat Gilles Muller 6-7(4), 7-5, 6-1, 6-2. Thai Danai Udomchoke received a late call-up to the tournament on Monday as a 'lucky loser' after Ivan Ljubicic pulled out with an ankle injury. Danai could hardly have been any less prepared for the demands of a Grand Slam clash and he never threatened to spring a surprise as American Sam Querrey cruised through with a 6-3, 6-4, 6-4 win. 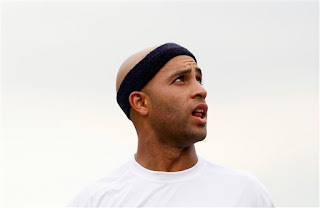 Another American James Blake however suffered a setback when he was beaten 7-5, 6-4, 7-6 (5) by 50th-ranked Andreas Seppi. I'm speechless... disappointed. 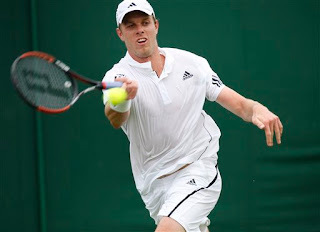 British wildcard entrant Jamie Ward suffered a straight-sets defeat on his Grand Slam debut against Fernando "Mohawk-No-More" Verdasco. 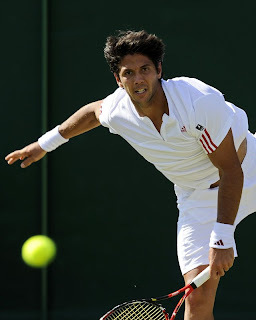 Verdasco who spotted a new hairdo wrapped up a comfortable 6-1, 6-3, 6-4 victory in a little over an hour and a half. 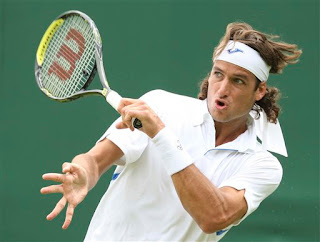 Pretty boy Feliciano Lopez joined Blake to become another seeded player to lose on Day 1. Feliciano lost to Slovakian Karol Beck 1-6, 7-5, 6-3, 4-6, 10-8 in nearly four hours on Court 18. 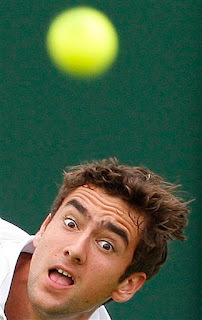 Marin Cilic became the last man through to the second round before bad light halted play. Cilic defeated Spaniard Alberto Martin 6-3, 6-4, 6-4. Maria Sharapova, who also paraded her military-themed jacket earlier, had a tough Day 1 at Wimbledon on Monday, rallying from 4-1 down in the first set to overcome Ukrainian Viktoriya Kutuzova, the top seed in qualifying, 7-5, 6-4. Serena Williams decided to go 'all English' this year. And despite the warm weather the American insisted on wearing her coat as she practised with Neuza Silva before the match began. 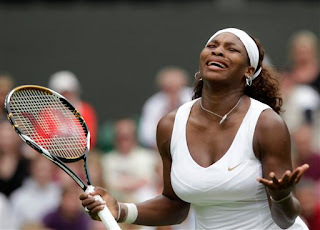 Serena easily cruised to the next round after winning 6-1, 7-5. Michelle Larcher de Brito toned down her grunts yesterday but still able to win against Klara Zakapalova 6-2, 7-5. Last year's semifinalist, Zheng Jie reached the second round after beating Kristina Barrois of 7-6 (2), 7-6 (4). Zheng, the 16th seed, will take on Daniela Hantuchova in the second round.